Are you wondering about Israeli couscous and how to cook it? 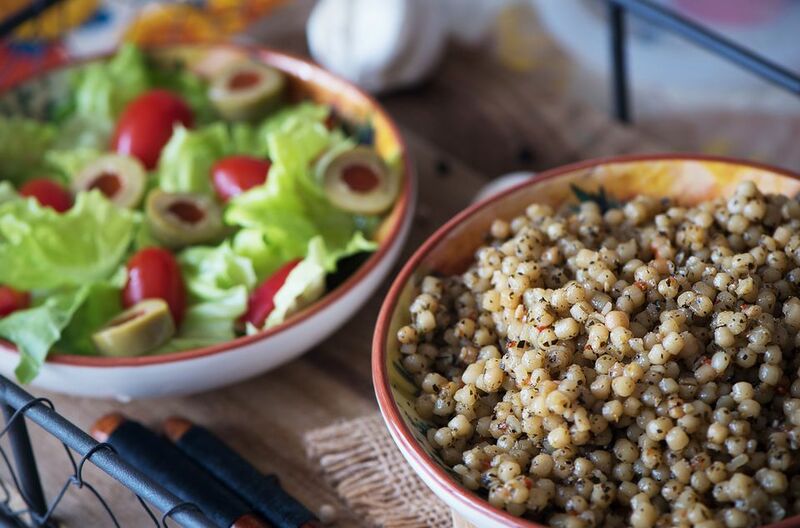 If you already love couscous, or, you're just curious about exploring different whole grains and foods from around the world, here's what you need to know about Israeli couscous, also called pearl couscous. Israeli couscous, also called pearl couscous, is similar to regular couscous in that it's a small, whole grain-like food made from semolina or wheat flour. While I've always seen it labeled as Israeli couscous, others might know it as "pearl couscous," "Jerusalem couscous," or, as it is known in Israel, "ptitim." Bob's Red Mill, one commonly known brand, labels their Israeli couscous product "Natural pearl couscous." So, what does Israeli couscous taste like? Because of its size, Israeli couscous has a slightly chewy texture, similar to barley, and, because it's toasted, it has a slightly savory flavor. Like regular couscous and other whole grains, however, Israeli couscous is rather bland without much of a strong flavor on its own and needs to be prepared with seasonings, spices, sauces or fresh herbs. Scroll down for some preparation and recipe ideas. You can cook Israeli couscous any number of ways. It can be used much like pasta, rice, or any other whole grain. Add a handful to salads, add it to soup to add a more full-bodied texture, or top it with a saucy vegetable stir-fry or roasted vegetables. Try making a savory Israeli couscous pilaf instead of a rice pilaf, or use it to make a chilled grain salad, like a quinoa salad or a rice salad. You could try Israeli couscous in any recipe that called for orzo as well. To prepare Israeli or pearl couscous, you'll need about 1 1/4 cups of water or vegetable broth for every 1 cup of dry grain. Simmer the grains stovetop, covered, for about 10 minutes. The grains fluff up just slightly, and, like barley, they have more an "al dente" mouth feel when done cooking. For a basic recipe with a bit more flavor, toast the dried pearls for a minute or two in a bit of butter, vegan margarine, or olive oil before cooking, just like you would do for making risotto.